Savvy customers are looking for smart solutions that don't limit their ability to express themselves no matter what environment their in. Trade show, event, corporate lobby, showroom, or even stage. The versatility of this system starts with its ability to be both a fabric and hard panel wall. Then, with multiple wall sizes, ability to stack those walls and numerous accessories to attach to the wall. These solutions can be rented or purchased. Best part is that this product is not a one trick pony ... the same back wall can become a tower, a conference room, a lightbox, hold monitors, hold heavy product, and so much more. It has quickly become an intelligent resource for any size company to start small, a simple 10' booth that forever has the ability to expand and grow into whatever fits the space and environment it needs to adapt to. Or, start large and reconfigure, split, or convert to stand alone kiosks, conference room, towers, branding walls, space dividers ... I could go on and on. The EZ Fabric Wall System™ combines the versatility of modular walls with the benefits of lightweight fabric structures. With a variety of widths and heights, the walls can be configured to make the most of any display space. Wall Assembly - EZ Fabric Walls are available in two wall corner assembly options (locked or welded frames). Locked walls can be broken down for overnight shipping. Welded walls can be shipped whole, are lighter weight, but are typically shipped via Ground methods. Graphics - The EZ Fabric Wall System™ is designed for use with Moss Photo Fabric® graphics – the highest quality printed graphics on fabric in the industry. 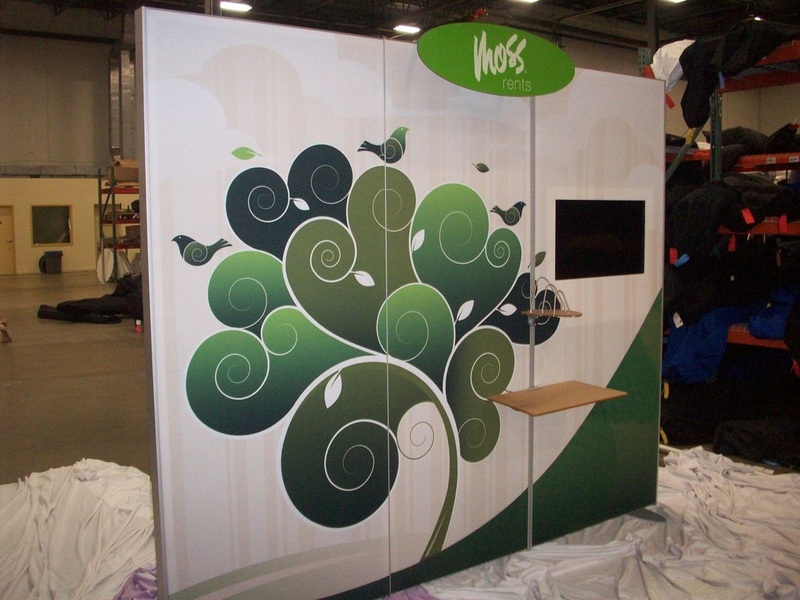 Graphics attach to the EZ Fabric extrusion using the simple Moss Groove gasket attachment. Moss also offers 3mm PVc UV printed hard panels. Accessories - Many accessories are available including internal lighting, monitor options, a sound and light blocking layer, shelves, and more. EZ Fabric Walls are versatile and can be easily used with existing systems. Applications - See the EZ Fabric Wall System™ in action! We created custom booth designs for a 10x20 Inline, 20x30 Island, 30x30 Island, and a 30x50 Island to show the varied functionality of the EZ Fabric Wall System™. Walls - The EZ Fabric Wall System™ is designed around a 39 in. W x 93 in. H wall with half width, half height and entry header size variations available. Curved variations are also available. EZ Interactive Wall » The EZ Interactive Wall is an interactive display with reactive sensors that allows users to drive content on an integrated LCD monitor with a wave of the hand. Corners, Columns & Caps - Add Columns between Walls to create rooms, towers, and add accessories. Finish with End Caps and Lock Plugs. Accessories - Moss offers a wide variety of accessory options – from monitor brackets and graphic headers to clamps for rigid materials. Moss also offers a Fabric Ceiling, ideal for conference rooms. Universal Attachment - Attach EZ Fabric Walls to existing systems or other Moss products such as Moss Groove™, Moss Max™, Shapes and Rentals using these attachment accessories. Base Plates - Base Plates should be used on walls without returns or with high load shelves and when monitors are used. Base Plates have a slim profile of 12mm thick and are available in a variety of sizes. Baseplates are sold with attachment hardware. Lighting - Moss offers several options for lighting booths designed with the EZ Fabric Wall System. From simple stem lights to suspended ceiling lighting and internal light box style lighting option, Moss offers a solution for any display. Shipping options » Moss offers a wooden shipping crate for fully assembled walls and two box systems for disassembled walls.